The electro-mechanical system allows the headlights to throw light in the direction of the curve, especially on widened roads. It also allows the driver to see and to be seen. Different manufacturers have different refinements, but this could become a mainstay as the IIHS estimates more than 1 lac crashes to have occurred on dark curves each year. This is the returning technology. Several manufacturers are tinkered with the idea of linking the headlight beams with wheel directions. It is done to move the light with the direction of the car. This system is equipped with advanced light sources like LED and Xenon, which offer optimized illumination of the roads during night time drives. 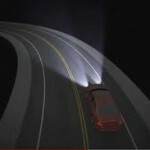 This system is continuously adjusted with the beam pattern to lit the entire scene according to the driving situation. Even when the car is moving through up hills and round curves, then the system maximizes the drivers visibility, while enabling earlier danger detections and quicker reactions. A turning light is also a feature which is activated at the speeds below 19mph and also with the dipped beam switched on for better illumination of tight corners. This system keeps the road surface correctly illuminated when the front vehicle is driving on hard deceleration, prevents the beam going up in the air when the vehicle accelerates, and also ensures that the beam light illuminates a curve instead of illuminating the side of the road. At slow speeds the corner lights are activated, which swivel up to 15 degrees to provide additional visibility for parking and the turning maneuvers. This system only works/comes with the Xenon lights, which are standard on the 135i and optional on the 128i. Know How to Become a Good Trader? What are the Food Sources Rich in Vitamin E?